My son loves this set! It gives his room a nice bright color. The quality is nice and I thought the price was good for all the pieces you get. Give your bedroom a wildly adorable update with the Urban Habitat Kids Safari Cotton Printed Duvet Cover Set. Printed on 100-percent prewashed cotton, the duvet cover showcases cute jungle animals roaming in lush green ferns. A solid aqua reverse provides a refreshing splash of color to perfectly complement the tropical design seen on the top of bed. Two decorative pillows, one with an appliqued toucan and another with embroidered geometric patterns, add a charming touch to the bedding set. 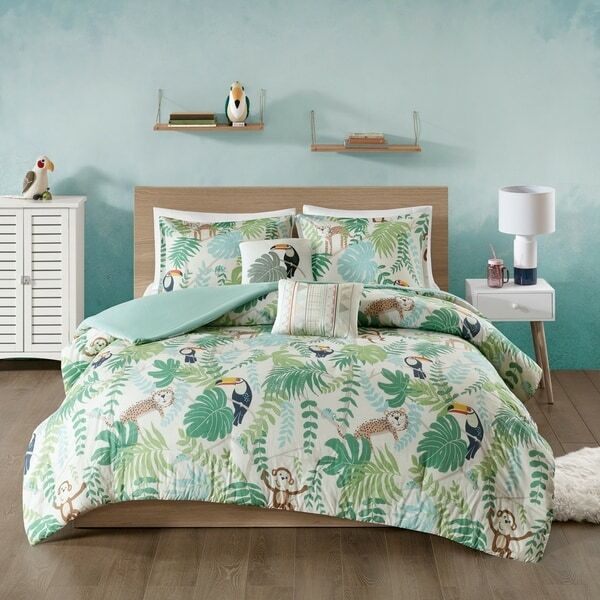 Easy to care for, this cotton printed duvet cover set is machine washable and will turn your little one's bedroom into a peaceful jungle paradise. Button closures and four inner ties allow you to place and secure a comforter insert within the duvet cover. Adorable. Colors are true to the pics. Really cute on bunkbeds for my grandkids.